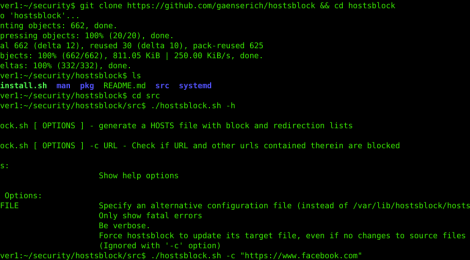 Browse: Home / Hostsblock – An ad- and malware-blocking script for Linux. Hostsblock is a bash script designed to take advantage of /etc/hosts file to provide system-wide blocking of internet advertisements, malicious domains, trackers, and other undesirable content. To do so, it downloads a configurable set of blocklists and processes their entries into a single /etc/hosts file. Hostsblock also acts as a command-line utility that allows you to block and unblock certain websites and any other domains contained in that website. – NEW: Enhanced security – Runs as an unpriviledged user instead of root. – Non-interactive – Can be run as a periodic cronjob or systemd timer without needing user interaction. – Extensive configurability – Allows for custom black & white listing, redirection, post-processing scripting, etc. – Bandwith-efficient – Only downloads blocklists that have been changed, using http compression when available. – Resource-efficient – Only processes blocklists when changes are registered, uses minimal pipes. – High performance blocking – Only when using dns caching and pseudo-server daemons. – Redirection capability – Enchances security by combating DNS cache poisoning. – Extensive choice of blocklists included – Allowing the user to choose how much or how little is blocked/redirected. ← trueseeing is a fast, accurate and resillient vulnerabilities scanner for Android apps.